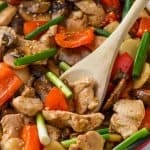 This Szechuan Chicken is better than take-out! It is easy, only takes thirty minutes to make, and you can throw in whatever vegetables you have in your refrigerator this week. If your family is craving chicken Szechuan style, this is the recipe for you! Preheat a large skillet over medium heat. Heat the olive oil and then add the chicken, stirring until no longer pink on the outside, about 5 minutes. While the chicken is cooking, mix the soy sauce, water, garlic, ginger, sugar, chile paste, and then whisk in the corn starch. Once the chicken has finished cooking, add the mushrooms and red peppers and cook until they are soft, about 5 minutes. Pour the mixed sauce over the meat and vegetables and cook until it has thickened, a few minutes. Stir in the sliced water chestnuts and bamboo shoots if using.